In this tutorial you will learn to update an existing TTORD user (John Doe). 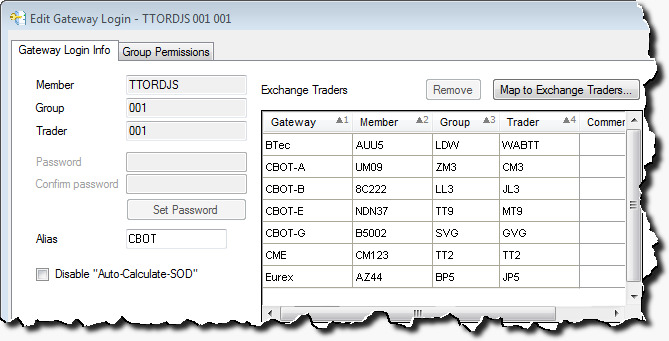 Using John's unique TTORD ID (TTORDJS001001) you will add a Eurex gateway to the CME, BrokerTec, and CBOT Gateways that John currently logs into. In addition, you will add corresponding product limits to John's Eurex Gateway Login. In the Display Name column filter, type John's display name to easily locate his user record. To open the Edit User window for JDOE, double-click on the row associated with John's user record. For additional ways to access the Edit User window, refer to Creating, Editing, and Deleting Records. Click Gateway Logins and then double-click the row for any of John's existing logins. The Edit Gateway Logins window appears. Click Map to Exchange Traders. 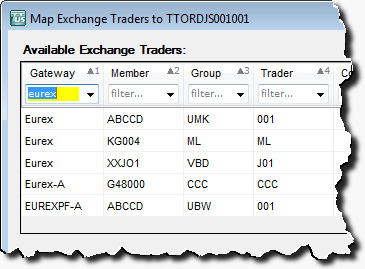 On the Available Exchange Traders section of the Map Exchange Traders to window, type Eurex in the Gateway column filter to easily locate any available Eurex MGTs. Note:If there are no Eurex MGTs available, click the Create button to open the New Exchange Trader window, and create a Eurex MGT. Using the arrow buttons, transfer a Eurex MGT from the Available Exchange Traders section to the Selected Exchange Traders pane. From the Edit Gateway Login window, click New Product Limit to create a new product limit. Select Eurex in the Gateway field, and edit the data in one or more additional fields (e.g. Change the maximum order quantity to 2000). John's new product limits display in the Product Limits pane.